My 7 year old had become somewhat of a shoe lover. She has developed quite an affinity for shoes. In fact, I don't know whether to be proud or scared! Ha! Given her new found fascination with shoes, I was thrilled when I was given an opportunity to check out Valentina Shoes - who offer young girls age 6 to 14 fun styles, bright colors, and cute details! From sandals, to flats, and espadrilles their footwear collection has everything to make any young fashonista's feet happy! Arianna received the Sage Fuschsia Sandals which she & I loved! The color is nice and bright for all types of summer fun, and the silver lining cut-outs add a playful detail that makes it unique. They do run big, so I would suggest you size down a full size. Arianna will have to wait to wear these comfortably for a few months, but given how fast our kids feet grown - she probably won't have to wait too long. 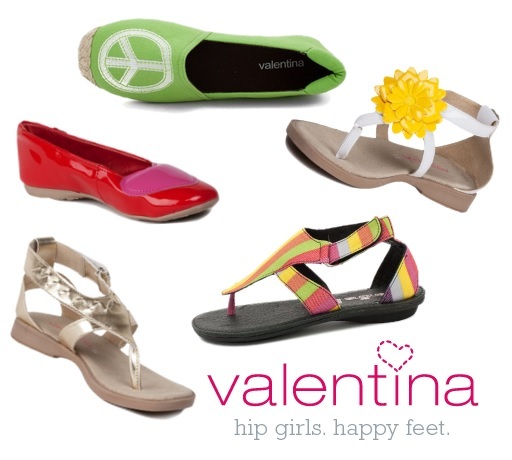 Make sure to check out Valentina Shoes for more fun styles! Prices range from $44-$48, and are available online and select stores. So cute! Love her little look!